This sense of anonymity is one way many of us would describe our understanding of Myron Avery. He has never had quite the same publicity or charm as the as the bespectacled, nonagenarian dreamer, Benton MacKaye. But it is the gruff, lawyer and Navy veteran from Maine who would walk each mile of the AT, organize trail crews, and in 1937, direct the Trail to the terminus we know today, Mt. Katahdin. After graduating from Harvard Law School, Avery joined the law firm of Judge Arthur Perkins in Hartford, Connecticut. Perkins was active in the New England Trail Conference and the Appalachian Mountain Club during his retirement, which exposed him to the idea of the Appalachian Trail though he did not attend the first conference. As the number of miles marked faltered after the Appalachian Trail Conference, Perkins became determined to join the committee and move plans forward to complete building the AT. Avery’s restless spirit was searching for the perfect outlet that would reconnect him to his roots in the woods and a way to channel his insatiable drive around the same time. The judge encouraged him to scout out a section of trail and with the help of friends, Avery marks a section in Northern Virginia from Snickers to Thornton Gap in 1927. At this point, Perkins doesn’t even hold an appointed position within the ATC. “While I haven’t any authority to say so, not being an officer of the General Appalachian Trail Committee, I seem to be the one most interested, and if you want to report directly to me, I will be glad to keep in touch with Major Welch (ATC Chairman) or anybody else interested.” he tells Avery after this first trail-blazing accomplishment. Over the ensuing weeks, Avery founds the Potomac Appalachian Trail Club and is elected to its presidency. During its first four years, the PATC alone, blazes 265 miles of trail and fosters the establishment of other instrumental crews. With momentum rising, Perkins and Avery organize the second Appalachian Trail Conference in 1928. The second conference shifts in focus from soliloquies on philosophy to planning, mapping, and hiking. By 1930, Avery becomes the unofficial Chairman of the ATC after Perkins struggles to recover after a stroke. A year later, 1,207 of the 1,300 projected miles of the trail are complete. “I am, really, not hard to get along with.” Avery says of himself, but a nickname like “Emperor Myronides I” gives one pause. 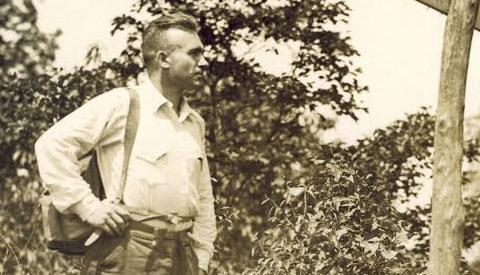 Avery was single-minded in his efforts to create the Appalachian Trail and if you were not similarly committed to the task or worse, became resistant to his way of doing things, he could be critical and caustic. The man to whom he owed much of his life’s purpose to at this time, Benton MacKaye, was no exception from his intense attitude. Avery didn’t feel MacKaye was supportive enough of the PATC and ATC or the partnerships he was trying to establish with the government. Avery resented the “cheerleader” role MacKaye thrived on, believing he should be building trail and hiking it, like himself and the rest of the volunteers. MacKaye in turn, accused him of having a “self- righteous, overbearing attitude and a bullying manner of expression.” Comments such as these would herald their schism in 1935. “When we get the Trail, Ben, what are we going to do with it?” Perkins had asked. The AT for MacKaye had always been part of a larger ideal. He wanted to overhaul modern values and create a space where people could become “harmonized with scenery—and the primeval influence—the opposite of machine influence.” He wanted to build camps and stores as well as have transportation available from the cities to the Trail to support this “Modern Barbarian” lifestyle and identity. Trail building was just the first step in his “wilderness utopia” vision. By contrast, Avery felt the AT was meant for “tramping, camping, and outdoor recreation”. The Civilian Conservation Corps, a government program, planned to build Skyline Drive where the Appalachian Trail was already blazed, leaving the ATC to debate amongst themselves if fighting the government or working with them was in the best interest of the Trail. Avery saw the benefits of cultivating a government alliance. The political weight and funds alone would be a significant help in getting the trail to a contiguous state and securely protected for the future. MacKaye and those in his camp, felt the road encroached on the wilderness and threatened his Modern Barbarian utopia. Throughout June 1935, letters would be written between the two men and the tenuous partnership was permanently destroyed. In the ATC meeting that year, Avery’s viewpoint was supported by the majority and as we know, the trail today runs parallel to Skyline Drive. The fathers of the Appalachian Trail never spoke again. MacKaye would go on to focus his energy on founding The Wilderness Society and would not take an active role in the Appalachian Trail until after Avery’s death in 1952. By 1946, it seemed Avery’s high octane lifestyle had caught up with him. After a stint in a military medical facility for “hypertension”, he suffered at least three heart attacks and was forced to retire from the government’s admiralty. In 1952 he relinquished his position as chairman of the ATC, though he continued to work tirelessly until the very end of his term. But Avery was never a man who would find solace in rest. Before very long, he began tracing his family history, a project that led him to Nova Scotia. At the Fort Anne National Historic Park, he suffered a final heart attack said by a doctor to have been so massive, “he was likely dead before even hitting the ground.” That Avery could not enjoy the calm and introspective time that the Trail affords for himself is tragically ironic. “The Appalachian Trail derives much of its strength and appeal from its uninterrupted and practically endless character. This is an attribute which must be preserved. I view the existence of this pathway and the opportunity to travel it, day after day without interruption, as a distinct aspect of our American life.” –Myron Avery, in his final report to the ATC in 1952. Today, there are about 19,000 miles of National Scenic Trails due in no small part to the unrelenting work of Myron Avery on the Appalachian Trail. “Avery, Myron.” Maine An Encyclopedia. 13 July 2011. Web. 05 Aug. 2016. Bates, Dave. “Myron Avery Portrait of a President.” Potomac Appalachian Trail Club. Gambino, Megan. “Tales From the Appalachian Trail.” Smithsonian.com. 13 July 2009. Conference (2000): 2+. July 2000. Web. 25 July 2016. Pesha, Ronald. “Myron Avery, Lubec, and the Appalachian Trail.” Lubec, Maine. Web.